Clackamas' Nick Lasko made an eagle on the seventh hole and added four birdies on the back nine to finish at 1-under-par 71 for a one-stroke victory over Barlow's Ethan Hoover at Thursday's Mt. Hood Conference boys golf tournament at Gresham Golf Course. Hoover offset three bogeys with birdies at Nos. 1, 10, and 16 to finish at even-par 72, two shots ahead of Central Catholic's Gavin Swartley. David Douglas' Andrew Baker shot 74 to finish fourth overall, while teammates Matthew Bollie shot 77, Jack Cochran added a 79, and Joel Sheetz an 82 as the Scots edged Central Catholic by one stroke, 313-314, for team honors. Clackamas finished third in the team race at 333, with Barlow (340) and Sandy (369) rounding out the top five. Lasko, medalist in all three league tournaments this season, drove the green at the 290-yard, par-4 seventh hole and then made a 5-foot, downhill, left-to-right putt for an eagle. The Cavaliers' senior again drove the green at the 285-yard, par-4 10th hole and made a 3-foot birdie putt after lagging from about 35 feet. Lasko added an 18-foot, downhill birdie putt at the par-4 14th hole, and then made a 2-foot birdie putt at the par-5 16th hole. Clackamas freshman Alex Lasko made birdie at the par-4 ninth hole and finished at 5-over 77, breaking 80 for the first time in league play. Cal Milligan shot 92, Ashton McCracken finished at 93, and Hunter Johnson had a 95 for the Cavs. "This year's squad is young," Clackamas coach Mike Freeborn said. "Nick is our only senior on the team and then we have some with experience and some brand new to the game." The Lasko brothers are locked in at No. 1 (Nick) and No. 2 (Alex) in the Clackamas lineup. The other three varsity spots are interchangeable, with Kellan Akers, Cole Allen, and Caden Clausse in the mix with Johnson, McCracken, and Milligan. "We've played pretty much all of them at the varsity," Freeborn said. "It's kind of been all over the place. For early in the season, I think some of the inexperience with playing 18 holes in a varsity match has ballooned their scores a little bit, but I think they'll go down as they get more experience." Central Catholic won the March 14 league opener at Willamette Valley Country Club in Canby, Clackamas finished first in the March 21 match at Glendoveer Golf Course in Portland, and David Douglas became the third team to claim the top team honors through the first three league matches. The teams return to action Thursday at Rose City Golf Course in Portland, with the first group scheduled to tee off at 1 p.m.
THREE RIVERS: Lakeridge's Aaron Buck fired a round of even-par 72, while Tualatin's Bryce Hatcher and Lakeridge's Ennis McKendrick finished two shots off the pace at Monday's Three Rivers League boys golf match at Willamette Valley Country Club in Canby. 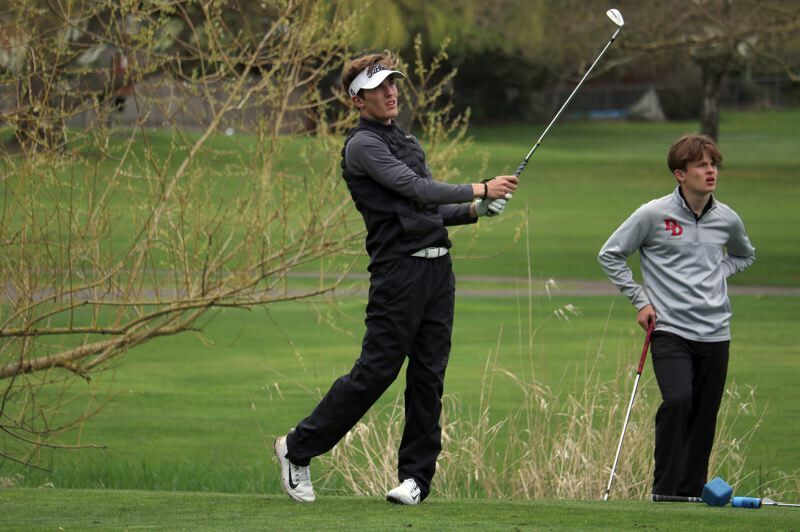 Oregon City's Max Fabrycki finished alone in ninth after shooting a 78 in a field of 34 golfers. Lakeridge's Leyton Richards shot 79 and Alex Moreau added an 81 as the Pacers won the team race with a score of 306 to runner-up Lake Oswego's 322. Oregon City shot 389. NORTHWEST OREGON: Scappoose's Chase Elliott finished at 2-over-par 73 for a seven-shot victory over La Salle Prep's Owen Tunstill in Monday's Northwest Oregon Conference boys golf tournament at Glendoveer Golf Course in Portland. La Salle's Andrew Keepes shot 85 to finish third and Wilsonville's Jacob Hausserman shot 85. Three other Wilsonville players finished among the top eight as the Wildcats shot 353 to win the team race, followed by Scappoose at 356 and La Salle at 358. MT. HOOD CONFERENCE: Central Catholic's Elise Deschaine finished at 3-over-par 75 to take medalist honors at Wednesday's Mt. Hood Conference girls golf match at Eastmoreland Golf Course in Portland. Clackamas' Kristin Senatra finished second with a round of 83, while Hannah Lim and Paige Vancil both shot 85 and Madison Cooley added a 98 to help the Cavaliers win the team race with a score of 351 to runner-up Central Catholic's 398. THREE RIVERS: West Linn's Olivia Venderby made a birdie on the par-5 18th hole and finished a 1-over-par 73 to claim medalist honors by five strokes over Alexandra Tomita of St. Mary's Academy at the April 1 Three Rivers League girls golf match at Oswego Lake Country Club. West Linn's Brady Turnquist shot an 82 to finished third, Oregon City's Sophie McCoy shot 83 with birdies at the par-5 fourth hole and the par-3 14th, and West Linn's Lauren Grothe shot 89 to round out the top five.